Nahe dem Meer und dem Zentrum von Santa Maria in einer ruhigen Gegend. Außergewöhnliche Meerblick-Terrasse. Schlüsselübergabe und Hilfe vor Ort. Angebotene Dienstleistungen: 1) Flughafen-Apartment-Taxi-Service mit Übergabe der Apartmentschlüssel 12,00 Euro pro Tag, 15,00 Euro pro Nacht 2) Küche mit Geschirr, Töpfen und Geschirr für 4 Personen Wasser und Strom sind immer inbegriffen. Der Wäscheservice ist im Preis inbegriffen. Zu wissen: Kaution erforderlich 150,00 Euro Miete: Ankunft jeden Tag akzeptiert. Taxi vom "Flughafen bei Ankunft und Abreise. We stayed there for 1 week and didn't miss anything. 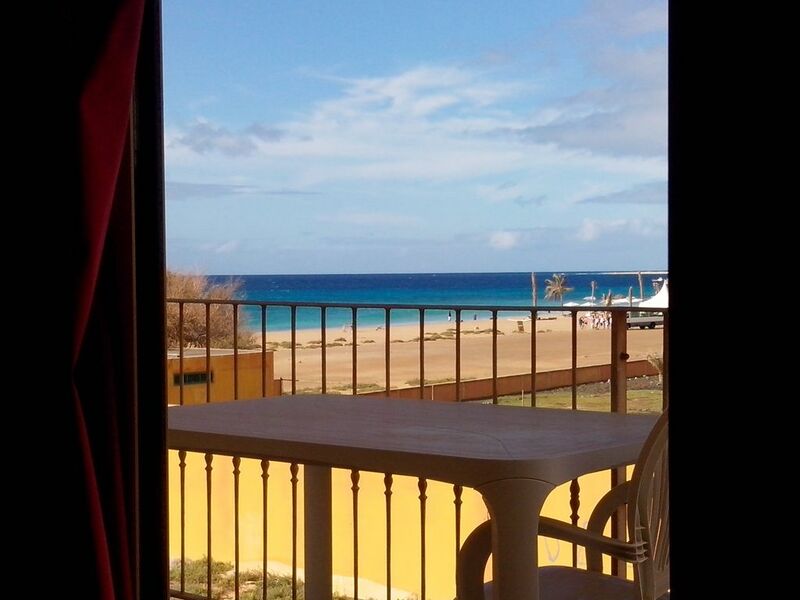 It's a nice apartment located in the east of Santa Maria, short distance to town and the stunning beaches. The accommodation is clean and tidy and secure. It is on the edge of town and so on a dirt road but within easy walking distance of paved roads and walkways into town. The nearest beach bar is 3 mins away and offer free sun beds and excellent food and drink with friendly staff. There are loads of eating places and bars within 5-10 minutes walk. The veranda gives a lovely view of the beach and sea although does need sweeping down every day. Would be beneficial if towels were changed mid week as they do get rather dirty. Really enjoyed our stay. And transfers were arranged to and from the airport. Super séjour au Cap Vert! L'appartement est très bien placé dans un quartier tranquille. Il est bien aménagé et très fonctionnelle, nous le recommandons vivement. Merci à Ezio et Lucas pour leur professionnalisme! Great value apartment in a brilliant location!!! Had a really good stay here. We arranged the airport transfer through the booking and had no problems on arrival. Luca was very helpful and friendly to help us get settled in and tell us about the town. The apartment has a fully equipped kitchen with everything you need to cook for yourself. Although it is not expensive to eat out and there are so many nice restaurants. The bed was comfy and the apartment is perfect size for a couple. There is no TV which is a good thing as nobody wants to go on holiday to watch TV. The balcony is sheltered from the wind due to the direction it faces and has brilliant views of the sea which is a massive positive in my opinion! It is in a great location for watersports - near to Angulo beach club (you can see it in the photos from the balcony). Its a 7-10min walk in to town and in my opinion is located in the better side of town (away from the big hotel complexes). Le uniche spese aggiuntive che ci possono essere ( facoltative ) sono il servizio taxi a/r dall' aeroporto che costa 12,00 euro di giorno e 15,00 di notte.